The hole had already been dug by the time we arrived, a mound of black soil and broken roots and clay sitting next to it. The Mountain Ash was sitting nearby waiting for its new home, a spot where our friends will readily see it from their living room window. Huddling around the hole was a small group who’d come to plant the tree in honor of our friend’s loss, as a reminder of her father’s life. The fresh cold air and the scent of soil and wet leaves under the early fall dusting of snow was invigorating, and a stark contrast to the dusty-closet, cardboard-box atmosphere I’d been immersed in for weeks now, packing for our upcoming move. One of those present in this little eclectic group—an impressive eighty-something-year-old—was as invigorating for me as the cold air. He’d purchased the tree and bags of compost and soil and brought large buckets of water (this plot of land on which our friends are building a home has no running water), and carried it all as though it weighed no more than a bag of popcorn. We fine-tuned the hole and planted the tree, and—aging hippies that we are—stood in a circle around the tree holding hands, and tried to find words with which to honor the crucible our friends had been thrown into with this loss, a loss in this case amplified by its suddenness, and the tormenting questions suicide leaves in its wake. Afterwards, we went into town for some Vietnamese food, to warm up and fill up and keep our tradition of a glass or two of wine. But before we did that we went inside to look at the pine home our friends are building (which incidentally, turns out to be perfect timing—work and reclusion hold much healing power for them.) This will be perfect, I see: open pine ceilings, trees just outside the windows, the loft already finished to a shine, gleaming. And now a Mountain Ash out the front window, as a reminder of the healing power of love and community, a reminder that our friend’s father lives on, a reminder that although he is no longer physically present, what he has given remains with her forever. “Take me to that place, where music sounds good again,” sings k.d. lang, and she did, she does. The sound two nights ago filled every inch of the auditorium, every pore in the room, and she took us there. And all night long, and the next day, walking with other Edmontonians who’d come out to Lift the Silence, the refrain went on and on in my ears—take me to that place, where music sounds good again. That place where it is enough just to be alive, where facing each new day with a smile comes easily. That place where walking through dewy morning grass in bare feet is the purest pleasure, one worth getting up early for. That place where walking anywhere, the feeling of elastic hamstrings with each bounce of step, is the purest pleasure. Take me to that place, before. Before I knew it wasn’t always enough to try hard, to pay your dues, to be kind and good. Before I doubted the motives and authenticity of our leaders. Before I knew dreams could be shattered and rupture us wide open and leave us raw to the elements. Before I watched that happen to my children, and my friends’ children. Before I knew about neurological or mitochondrial damage, before the stranger in the mirror, before we were orphaned, before we broke each other’s hearts. Before I knew some who heard the music and loved it completely, only to have it silenced in a moment by being in the wrong place at the wrong time, or by some runaway cells that moved in and took over. Before I knew the music could morph into cacophony, go quiet, even stop altogether. Before I knew some who panicked in the silence, and left us forever. k.d. lang took us there the other night, not back to before all that—that’s never possible— but somehow, to that place where music sounds good again. And maybe the echo will be enough for a while again, for most of us at least. 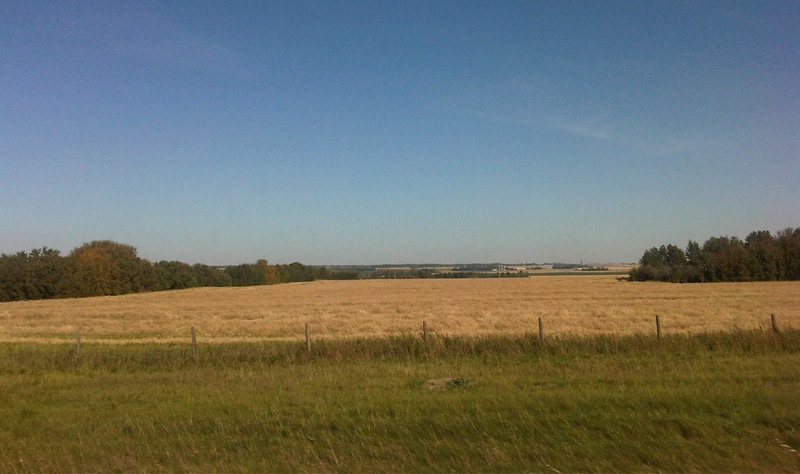 A drive out into the late-summer Alberta country-side: beauty. A memorial service. Two suicides and one attempted suicide in one week. There is no way to reconcile the beauty with the pain. My friend tells his family’s story here.